Got a green thumb? With the Bloomers Rail Planter, you can enjoy harvesting herbs, vegetables, and flowers even if you live somewhere with limited space. The Bloomers Railing Planter is designed for dimensional lumber and metal railings that are 1.25” to 3.875” wide (2x1, 2x4 and 2x6 railings traditionally). Stabilizer fasteners are provided for you to install this rail planter on your deck or balcony rails. Just insert at the desired spacing and gently pound in with a rubber mallet. You can further secure the planter with tie downs, bungie cords or by using wood screws and scerwing the planter directly into the railing (use caution when drilling screws through the plastic and wood railings). In addition, the 24” length of this rail planter can accommodate twice the amount of plants as a normal-sized rail planter. 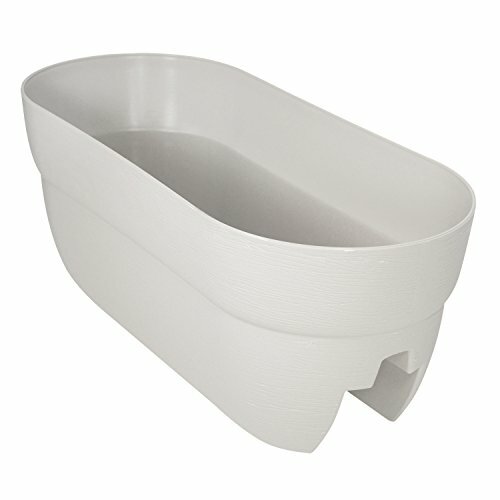 Made from durable polyethylene resin, this planter can withstand any weather conditions and won’t crack. And because it's HDPE, it is BPA free and perfectly safe to contact edibles at it does not contain, nor ever leach, harmful chemicals. Additionally, the drainage holes at the bottom of the planter allow deep, plant roots to breathe and prevent stagnant water from accumulating. Enjoy planting and harvesting from your outdoor railings, or beautify your front porch with vibrant flowers in the Bloomers Rail Planter from EMSCO Group. FITS DIFFERENT RAILS - Accentuate your home or business with a planter that works with decks and balconies with wood and metal railings that are 1.25" or 3.875" (2x4 nominal) wide. The included fasteners help stabilize the planter over the rail. LONGER PLANTING AREA - This rail planter measures 24" lengthwise and accommodates twice the amount of plants as a normal-sized rail planter. The wider planting area also allows you to cover more space over your balcony rails. DURABLE CONSTRUCTION - The Bloomers Rail Planter is made from durable, weatherproof resin construction. It can resist any kind of weather, as well as the harsh temperatures of summer and winter. Unlike other rail planters, this resin planter won't crack when exposed to extreme weather conditions. EASY MAINTENANCE - With the Bloomers Rail Planter, you don't need to worry about stagnant water accumulating. It has drainage holes on the bottom to help drain water and help deliver oxygen to plant roots. VERSATILE GARDENING CONTAINER - Whether you live in a big house or a small apartment, you'll want to add a personal touch to your living space. Beautify your outdoor garden with chic Bloomers Rail Planters! Even if you're confined to a limited space like a condo, you can plant flowers, herbs, and vegetables in these railing planters. With Bloomers, you can enjoy organic produce wherever you have a rail!